Time to get your scoop on! Chilled salads like these make great side dishes and sandwich fillings, and they're super-refreshing. Keep these recipes handy now that temperatures are on the rise. Chill out and eat up! In a medium-large bowl, mix all ingredients except Dijonnaise. Add Dijonnaise and toss to coat. Chill before serving or dig right in! HG Tip! Click here for the 411 on hard-boiling egg whites. Another HG Tip! If you can only find sun-dried tomatoes that are packed in oil, drain and rinse them really well, and then pat dry. This will get rid of excess fat. Mmmmm... A popular scoopy salad gets all HG-ified. Lucky you!!! In a large bowl, thoroughly mix yogurt, mayo, lemon juice, and seasonings. Add remaining ingredients and toss to coat. Chill before chewing, or just gobble it up! Good news... we've got TONS of salads for scooping! 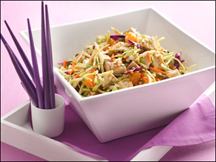 Check out our much-loved Scoopable Chinese Chicken Salad -- mandarin orange segments make this recipe amazing. 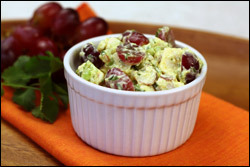 Click here for not one but THREE fantastic recipes -- Devil-icious Egg White Salad, Santa Fe Chicken Salad, and Simply Scoopy Seafood Salad! Change things up and go for pasta! Our Creamy Dreamy Macaroni Salad is totally ready for that neighborhood block party. This salad is as colorful as it is delicious... It's our Citrus-licious Egg White Salad! TV-famous deli-style salads! Click here for Scoopy Salmon Salad, and click here for Veggie-Loaded Tangy Tuna Salad. And if you've got a copy of Hungry Girl 200 Under 200 (why wouldn't you? 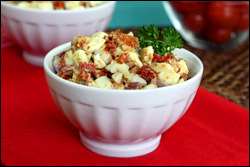 ), flip to the "Scoopable Salads" chapter for even more good stuff!!! Who isn't looking for great summertime recipes? Click "Send to a Friend" to pass these around. Happy National Hamburger Month! For a totally classic, guilt-free beef burger, you MUST try our Chief of Beef Cheeseburger. Do it!